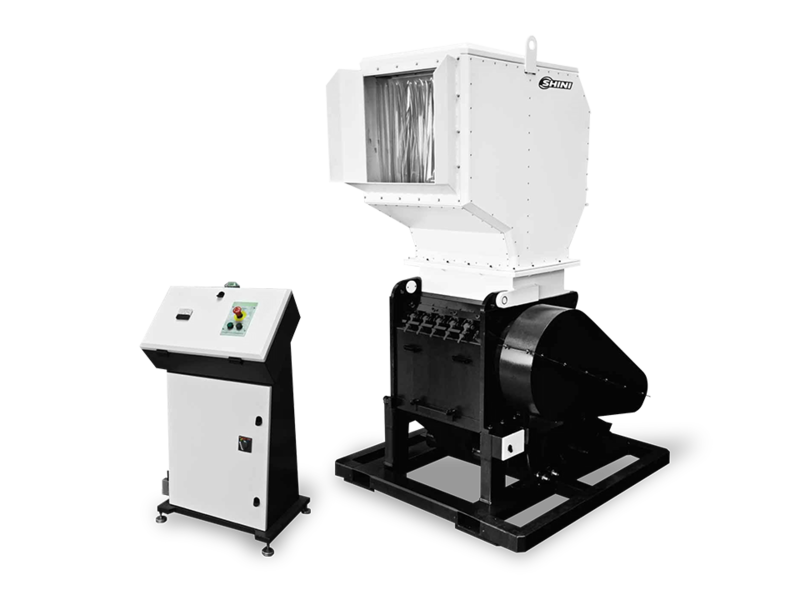 SG-50B series granulators are applicable to granulate various kinds of plastic materials from injection molding, blow molding or extrusion molding. This series features compact design, easy operation and quick blade replacement. Gradually inclined cutting and integrated power design offers a better cutting effect and a lower noise level. Rotating cutters adopt V-type cutting technology which can send the feeding material into the center of rotating cutters so to prevent the material from adhering onto the inner side of the cutting chamber while enhancing its wearability. The cutters are made of imported high quality steel featuring wearability, high rigidity, long service life and reusable after re-sharpening. Cutting chamber made of high rigidity material, after processing by CNC machine, has the features like high intensity, super wearability, no contamination, long service life and easy for maintenance and repairing. Both feeding hopper and screen cradle can be opened and closed by the electronic handspike system which ensures safe operation. Cooling water device at the rear plate of cutting chamber can effectively cool down the cutting chamber and prevent the inside material from melting up.